The guided-missile cruiser Monterey will deploy on Oct. 16 as the Navy shuffles ships around to ensure there are enough ballistic-missile defense ships in the Pacific in the wake of two major accidents that rendered the destroyer’s McCain and Fitzgerald unable to deploy. “Monterey will leave on a previously unscheduled deployment to the 5th and 6th Fleet areas to conduct maritime security operations,” Lt. Cmdr. Courtney Hillson told Navy Times Thursday. 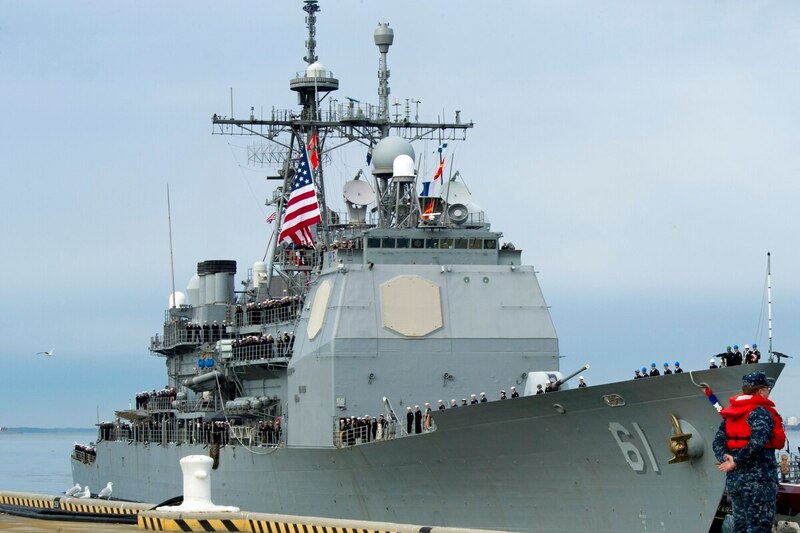 “This deployment will allow the Hawaii-based destroyer O‘Kane to deploy to 7th Fleet to provide more BMD-capable ships in the region,” she said, referring to ships with ballistic-missile defense systems. The demand for ballistic-missile defense capabilities in the west Pacific has intensified as North Korea continues testing missiles, putting allies on edge in Japan and South Korea. Meanwhile, two Navy BMD-capable destroyers previously in the Pacific, the McCain and Fitzgerald, suffered catastrophic damage in unrelated collisions this summer. The O’Kane was originally scheduled to deploy to the 5th and 6th Fleet areas, which includes Europe and the Middle East. The Norfolk, Virginia-based Monterey will take its place there, so O’Kane can deploy instead to 7th Fleet in the west Pacific. It will be Monterey’s second deployment to both regions in the past year. Monterey left Norfolk June 1, 2016, as part of the Eisenhower Carrier Strike Group and spent most of that deployment in 5th Fleet supporting operations there. The ship returned home Jan. 19.